Is Professional Resume Writing for You? Well, that depends. You see, resume writing can be a tricky task. Can you just do it yourself, Of course! Will it be as effective as having professional resume writer create it? Chances are, no. If you’ve been job hunting for awhile and you’re just not getting leads or the phone is ringing begging you to come in for an interview, maybe it’s time to turn it over to the pros. Why Should You Hire a Resume Writer? Be proud of the results! Customer Reviews $99.95 Perfect for...a job seeker who requires a company with strong customer service, excellent quality control, and a unique ability to create striking documents that grab the attention of prospective employers. 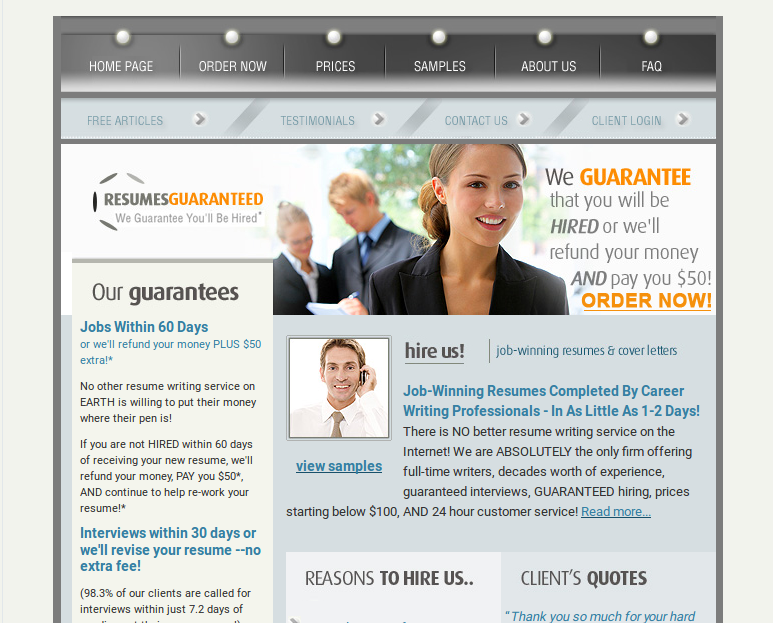 Customer Reviews $99.95 Perfect for...a job seeker who wants guarantees not only for interviews but employment as well. If you are not hired/working within 60 days, they'll refund your money AND pay you $50. Customer Reviews $89.95 Perfect for...a job seeker who wants results: In about two years they have only had 21 requests for rewrites out of thousands of resumes written. That equals out to be greater than a 99% satisfaction level from their customers.